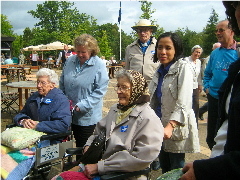 The College enjoys the support of a lively and growing Friends Association.Founded in 1994, members of the Friends are committed to praying for the work of the College and to raise funds to provide extra facilities to enhance its life.The Friends enjoy an active calendar of social events and outings with Residents both from the Cloisters and the Nursing Wing. There is a regular Newsletter to keep in touch with life at the College, forthcoming activities and the projects which the Friends are supporting. Friends also receive a copy of the College Chronicle, an occasional journal which contains articles about the history of the College, theological items and insights into the former ministry of Residents. Members who live near enough to visit the College are warmly welcomed and encouraged to become actively involved in College life.A major event in the year to which all are invited is the annual Garden Party which follows the Patronal Festival service in mid-June. This takes place in the delightful setting of the Croquet Lawn in the main quadrangle.Membership of the Friends is open to everyone who wants to support the work of the College. To receive more details and an application form, please click here.